WARNING: THIS IS THE 3RD BOOK IN A SERIES. IF YOU’VE NOT READ THE FIRST TWO, MAJOR SPOILERS. John Cleaver has called a demon—literally called it, on the phone, and challenged it to a fight. He’s faced two of the monsters already, barely escaping with his life, and now he’s done running; he’s taking the fight to them. But as he wades through his town’s darkest secrets, searching for any sign of who the demon might be, one thing becomes all too clear: in a game of cat and mouse with a supernatural killer, the human is always the mouse. In I Am Not a Serial Killer we watched a budding sociopath break every rule he had to save his town from evil. In Mr. Monster we held our breath as he fought madly with himself, struggling to stay in control. Now John Cleaver has mastered his twisted talents and embraced his role as a killer of killers. 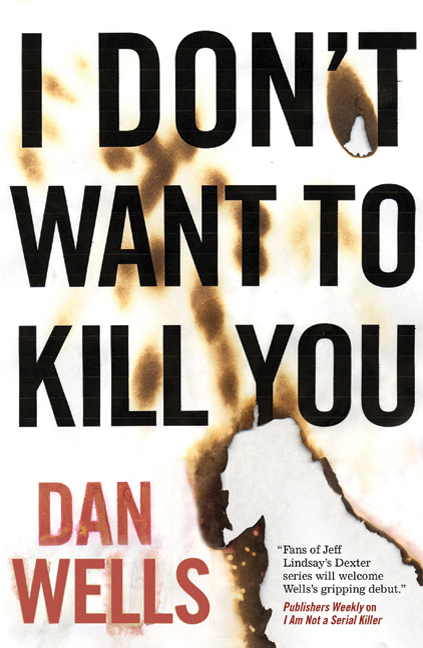 I Don’t Want to Kill You brings his story to a thundering climax of suspicion, mayhem, and death. I will forgive pretty much anything if the ending of your book is good enough. Even a mediocre book with an amazing ending will make me happy, as long as I get through the whole thing. I think that this is because I will remember how you left me feeling. Strong feelings, especially, at the end of the book, will override anything that came before, and that’s the taste that I am left with when everything is said and done, and the book is over. This is why people will tell you to push through the middle books of the Wheel of Time, for example—get to the ending, and it’s all worth it. That’s likely why Rothfuss is so paranoid about actually finishing and releasing the 3rd Kingkiller book. Yeah… I got a little depressed by the fact that John Cleaver gets more dates than I do. The same building tension, the mystery of the demons and who is killing people in Clayton County (Seriously, how many books before the whole place is depopulated? ), all of that, is here again. If you enjoyed the first two books, and you don’t mind a little romance—even if it is weird romance through the eyes of a sociopath—then you’ll enjoy the first half of the book. Perhaps the first 2/3, or even 3/4. Regardless, the ending will blow you away. The stakes are so much higher than they have been before, the situation seems more impossible… And the way the climax and aftermath is handled is just masterful. I can’t say too much more about the ending, because that would totally be giving away spoilers, but I will say that it is totally worth it, and I am glad I read this book. And that I have the next one on hand, right now. In summary, I Don’t Want to Kill You got off on the wrong foot with me, but by the ending I liked it more than any of the other books in the trilogy. A good ending will forgive pretty much anything else, and this one more than delivers on its promise. I give it a high four out of five stars (4.5 if I did half stars), and a high recommendation. Now off to start the 4th one.